The information on this page is provided as a resource in the effort to share lessons learned to any Legionnaire working membership in the American Legion. There is no cost associated with these products. This page is not endorsed by The National American Legion. Everything here should be personnalized for thier Post. If you like what you get consider making a donation to Operation Provide Comfort, see the link below or visit the PTSD & Provide Comfort page. Do you believe in the American Legion? Legionnaires who recruit 50 or more new members (transfers do not count as new members) into The American Legion by the May target date will qualify for enrollment in The American Legion’s elite Gold Brigade. These Legionnaires will be awarded unique gifts that designate affiliation with the Gold Brigade of The American Legion. The gifts awarded to a Gold Brigader will depend on the number of times he/she has qualified for this award. First time Gold Brigade members will receive a Gold Brigade patch, a special Gold Brigade cap pin, a Gold Brigade certificate, and a designer jacket or polo shirt or sweater with a Gold Brigade logo. 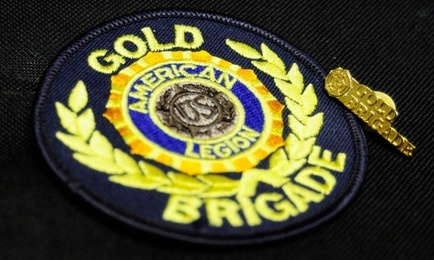 Second time (or more) Gold Brigaders will receive a Gold Brigade patch and certificate, a hash mark for a jacket sleeve, and a designer jacket or polo shirt or sweater with a Gold Brigade logo. Keep bringing in 50 or more new members each year and the honors continue. A Gold Brigader who has won the award for five consecutive years is eligible for a distinctive Gold Brigade blazer. A Legionnaire may only qualify once every five years. And a Gold Brigader who has earned the award for at least six consecutive years or more is eligible for a $150 check and a Legion cap with the inscription "Master Recruiter." Those Legionnaires who recruit 25-49 new members into the Legion by the May target date will qualify for the Silver Brigade Award. A silver pin and certificate will be awarded. Silver Brigade and Gold Brigade awards cannot both be awarded to a recruiter during the same membership year. The Post Commander will complete the form and forward to the Department adjutant for certification. Membership Card Template. Designed to use with Mail Merge, although you can type in the data. You can download your Post membership on MyLegion.org and import it into Access of Excell. When printing ensure you use "user preferences" for paper size when printing. Sample Renewal letter for Early Bird Renewals. Change to fit your needs. Vietnam Veterans Memorial Post 295 has been supporting wounded warriors since 2003 at the Bethesda National Naval Medical Center, now Walter Reed Military Medical Center. Operation Provide Comfort was the inspiration for Heroes to Hometowns and Operation Comfort Warrior. Your donation will ge to assist Post 295 in serving holiday meals to the warriors, their families and staff at the WRMMC. Last year on December 26th, we served over 140 meals in the hospital ward. The meal consisted of turkey, stuffing, green beans, sweet potatoes and deserts. All cook by members of American Legion Post 295 and the American Legon Auxiliary Unit 247.